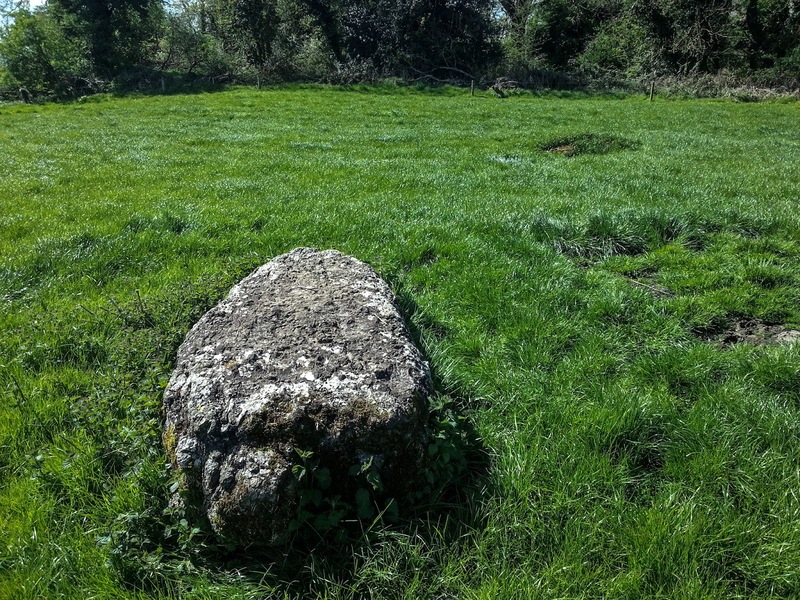 The Standing Stone: Guest Post: "Rathurles and surrounds – A forgotten royal complex and a previously unrecognised henge?" by Derek Ryan Bawn. 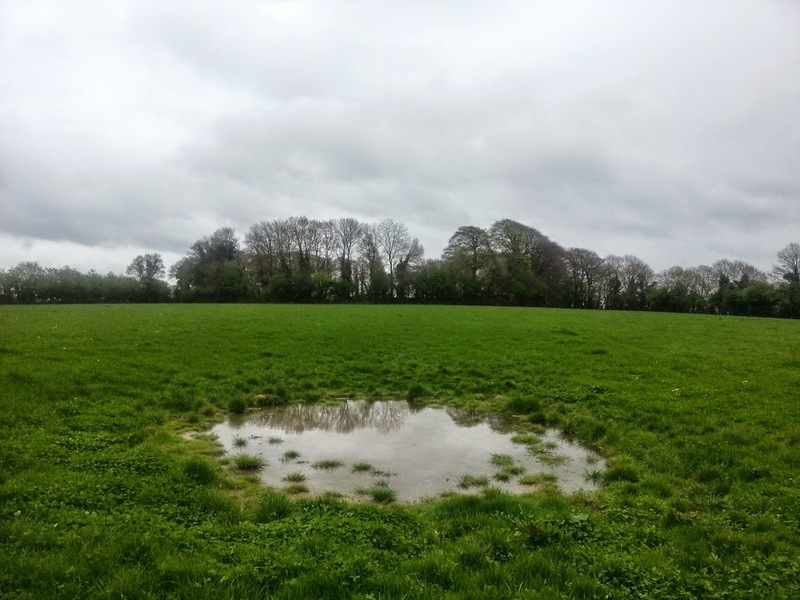 Guest Post: "Rathurles and surrounds – A forgotten royal complex and a previously unrecognised henge?" by Derek Ryan Bawn. Church - "Situated in the interior of a ringfort (TN021-012001). A well-preserved fifteenth-century rectangular church (dims. 9.1m N-S; 17.4m E-W; wall T 0.85m) of roughly coursed limestone. The N and S walls stand to a maximum height of 3m with coping stones in situ on both gables and an external base-batter (H 1.4m; Wth 0.15-0.2m) is visible. At the W end of the N wall there is a segmental arched doorway with its sides altered. A central two-light ogee-headed window occupies the E gable while there are single-light flat-headed windows near the E and W ends of the S wall, at the E and W ends of the N wall and at first-floor level in the W gable. Beam-holes at the W end of the N and S walls supported first-floor accommodation with attic above. There is an aumbry in the E gable and a piscina in the S wall with basin missing. In 1306-8 William Haket was chief tenant of the lands around Rathurles and held the land of Theobald le Bottiller (PRI rep. DK 39, 24)." Redundant record - Listed in the SMR (1992) as a souterrain possible, not included in the RMP (1998). 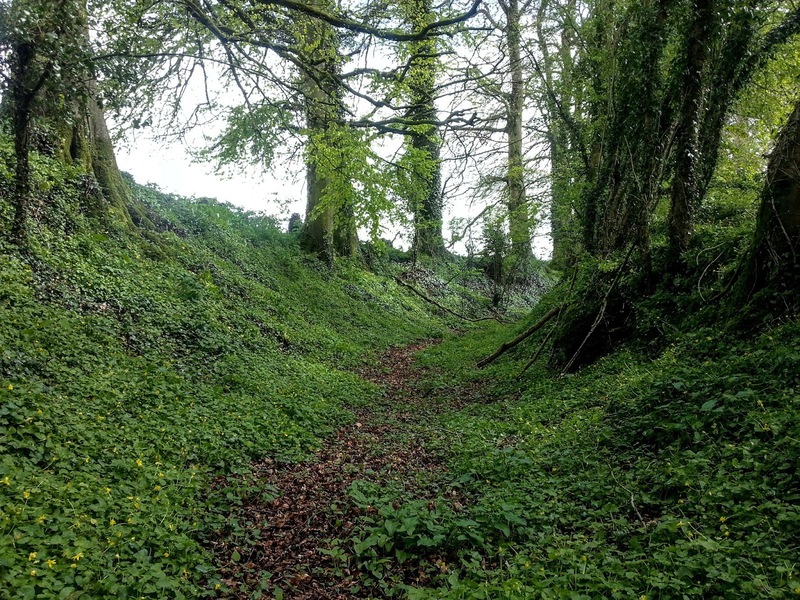 This site is referred to in the OS namebooks: 'There is a subterranean passage - leaves the fort in direction of Rathurles Castle, with which it is supposed to communicate' (O'Donovan, c.1840, Unpublished). There is no other evidence, documentary or physical, to suggest this souterrain exists. Underground passages are frequently attributed to sites without any factual basis. Gateway - Listed in the SMR (1992) and RMP (1998) as piers. 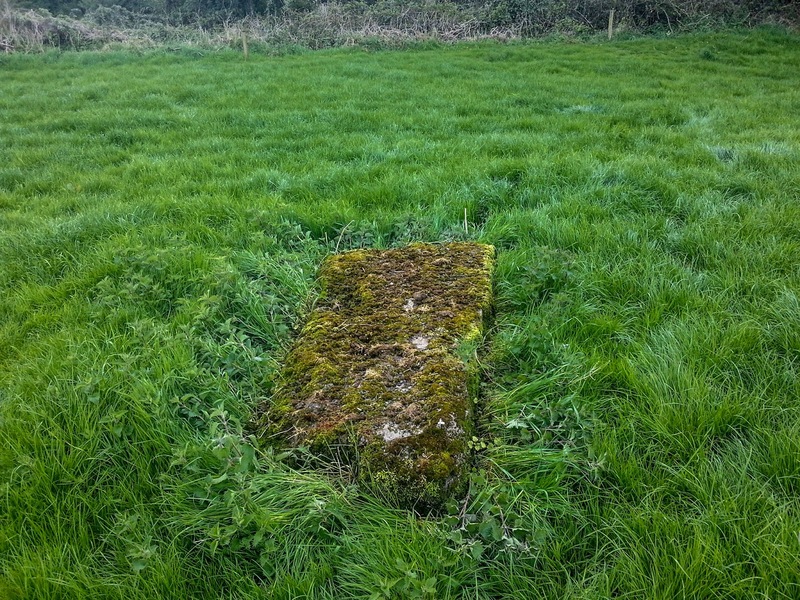 These gatepiers are located in the field NE of Rathurles ringfort (TN021-012001). 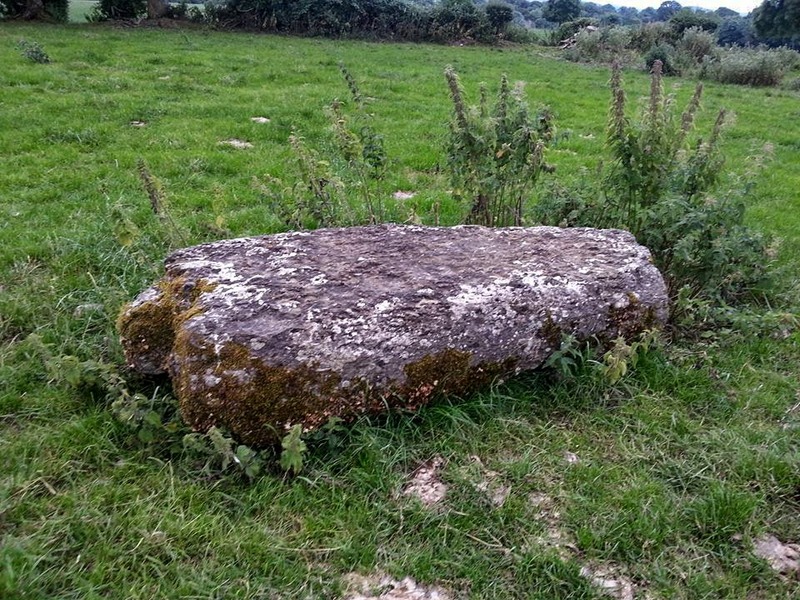 They consist of two large recumbent limestone blocks fomerly used as gatepiers to mark the entrance to the ringfort and are likely to be of nineteenth-century date. What these do not adequately describe is some of the features that appear on the old 1840s ordnance survey maps. 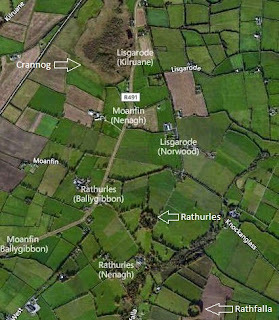 The map shows what is now the redundant record as “Entrance to Subterraneous Passage” to the west of the ringfort and “remarkable stones” to the east. The “remarkable stones” being the 19th century gate-piers. 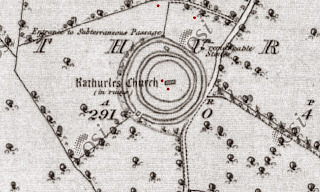 The author first visited Rathurles in approximately 2007 and was impressed by its size and how unusual it was for a church to be built within a ringfort. Not much more was thought of it as there was very little literature on it. The author recalled from a documentary on RTE called ‘Secret Sights’ that Rathurles was known as the “fair of Munster” but other than that no further notice was taken. When it became easier to view the old 1840s OS maps online and seeing the interesting features mentioned above the author decided that another visit was more than warranted. 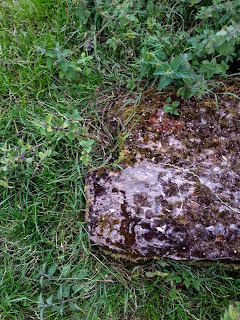 At this time the author inspected the “remarkable stones” which are actually located to the north of the site. 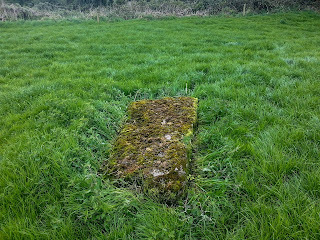 The stone closest to the ring-fort is 2.4m long x 1.1m wide x 0.23m deep and the other is 2.2m long x 1.1m wide x 0.5m deep. 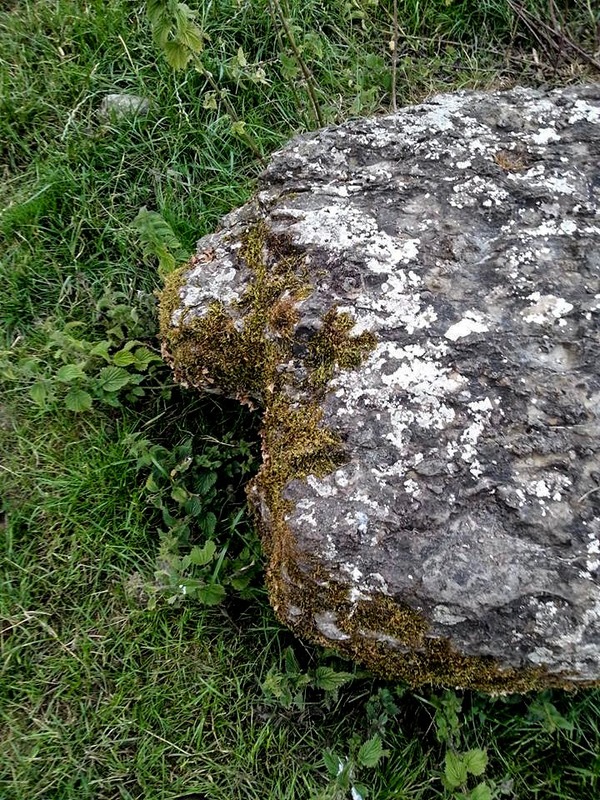 Both stones have a “tenon” on the North-eastern edge. On the stone that is furthest from the ring-fort, the tenon is not the full depth of the stone. 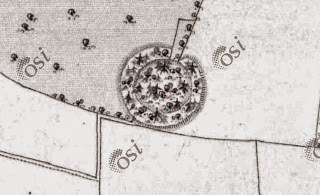 The author also noted an unusual feature to the west of the ring-fort where the “Entrance to Subterraneous Passage” was noted on the 1840s map – basically a deep round depression – approximately 1.5m deep with a diameter of 8.5m. However this location does vary with the note in the OS namebooks suggesting the passage is to the east. These anomalies led the author to further research and to this article. The author visited the local studies area of the library in Nenagh and found a book that mentions Rathurles called The History of the Ely O’Carroll Territory or Ancient Ormond by Rev John Gleeson (1915). This book gives some information on the founding of the town of Nenagh. The name Nenagh comes from the Irish for Aenach which according to Gleeson was a week-long “fair.” In Gleeson’s book he states that “The first beginning of Nenagh, in the Pagan days, before Christ, was the erection of an Irish rath or fort; the second origin of the town was the establishment of the Aenach in the year 130AD; as explained.” He then goes on to say “This rath seems to have been the great circular mound at Rathurles; this word means a strong fort – durlas means strong.” Unfortunately Rev Gleeson does not reference any of this so it has not been possible to confirm where he sourced this information from. He then goes on to describe for 4 pages about ring-forts in general and the social order of those who lived in ringforts but none of it seems to refer specifically to Rathurles. 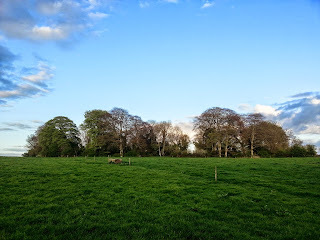 Next he returns to Rathurles to say “The number of circular mounds that surround the rath of Rathurles and the size of this fort prove that it was the residence of an Irish lord or prince. In ancient times it was surrounded by the smaller raths of the followers and tenants of the chieftain. In the time before the coming of the Butlers to Nenagh, Rathurles was the only town which existed : it was the cradle of the modern town." 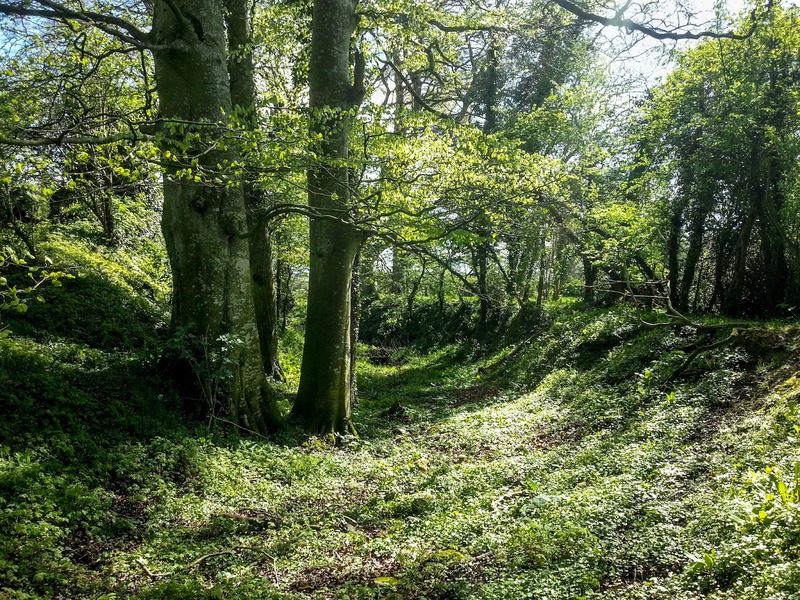 Later he goes on to say “Rathurles is said to be a rath-cave, having underground chambers.” He also suggests that St. Patrick would have visited during the Aenach on his journey around Ireland in 470AD (on his way to Lorrha). Gleeson goes on to describe generally what an Aenach is and tells us that this description is taken from Joyce’s Social History. Finally he takes a direct reference from the same book “The memory of one important fair is preserved in the name of Nenagh in Tipperary. The yearly fair held here is called Aenach Urmhumhan (Enagh Uroon), meaning the Fair of Ormond at East Munster: the old people have quite forgotten the meaning of ‘Uroon’”. Much of what Rev Gleeson writes about would now be taken as inaccurate such as describing raths as being inhabited from the time of the Fir Bolg but some of it is broadly correct such as his description of the stratified nature of society in early Ireland. The author found another interesting book in the local studies section of Nenagh library called “Nenagh & Its Neighbourhood” by EH Sheehan. In it the following quotation was found “At Rathurles Cross is one of the great monuments of Irish antiquity. 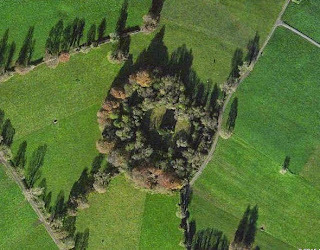 This is the great triple-ringed earth fort of Rathurles, uninhabited-now at least-since the 12th century. In Ormond only the" meadow fort" of Kilteelagh, near Dromineer, approaches it in area. 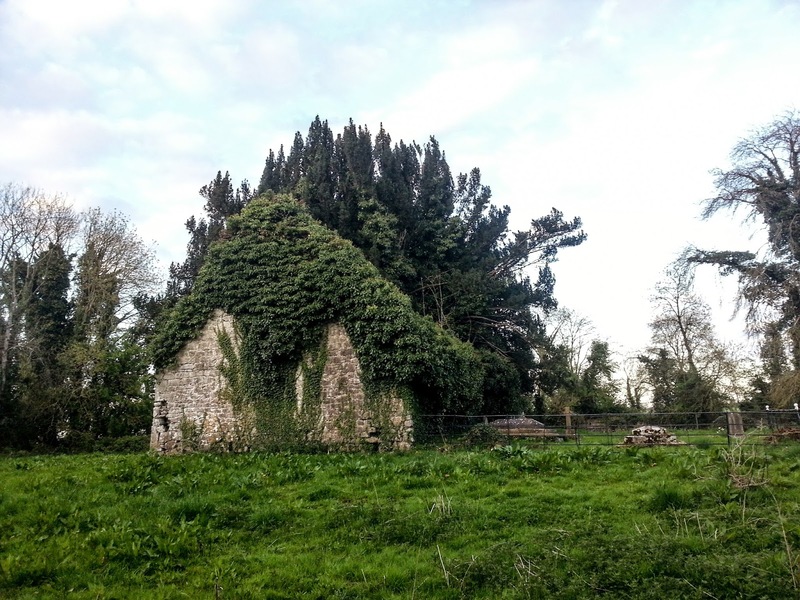 Finely sited on an eminence, its whole appearance, even now, proclaims that it was once the great wattled dun of the early Chieftains of Ormond long before even Nenagh was heard of. On the northern side of it will be found near the ancient entrance two “Remarkable Stones" as they are shown on the Ordnance Sheets of 1840. That they were the gate piers of the fort has been confirmed recently on inspection by the highest modern authority-inspection of them will show on each a short projecting tenon to engage with the lintel. 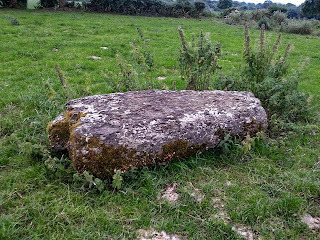 The authority referred to writes:-" I judge them to be the jamb-stones of a very monumental doorway, almost megalithic." There are no historical documents relating to Rathurles.” This book looks to have been originally published in 1949 and so may have used Rev Gleeson’s book as a source. From here a number of searches online to find any other information on Rathurles drew a blank. The author decided then to go to where the local Irish Folklore Commission microfilm was kept in Thurles library to see if there were any other references in local folklore to the ring-fort. There was very little about it with only a couple of mentions. In one there is a description of "lights" in the fort and in another a "white woman" haunts the fort. Another describes it as having being built by "the Danes". For such a large and impressive monument there seems to be very little about it. While there the author spoke with Mary Guinan Darmody and she was kind enough to take out the OS letters books by Donovan referring to Rathurles. In the OS letters the ringfort was also referred to locally as having being built by the Danes and that a great battle took place at "Barnaderg" in the vicinity. Barnaderg is noted on the 1840s OS map and translates as the "red gap". It looks to have been a crossing point on the nearby Olatrim River (less than 500m away). The name may be a reference to the blood-shed. It also mentions that a great number of bones were found within the fort and again makes reference to a battle. 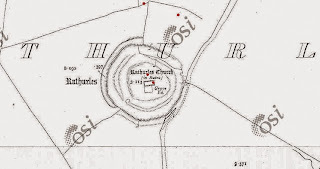 Later research found in The Annals of the Four Masters that Brian Boru suffered a defeat by Maelseachlainn at Rathurles with the fort being burned during raids in 994 and 1056. This may be a reference to these battles. What is unusual is that no mention is made to the "fair of Munster" in any of the Irish Folklore Commission micro-film above. 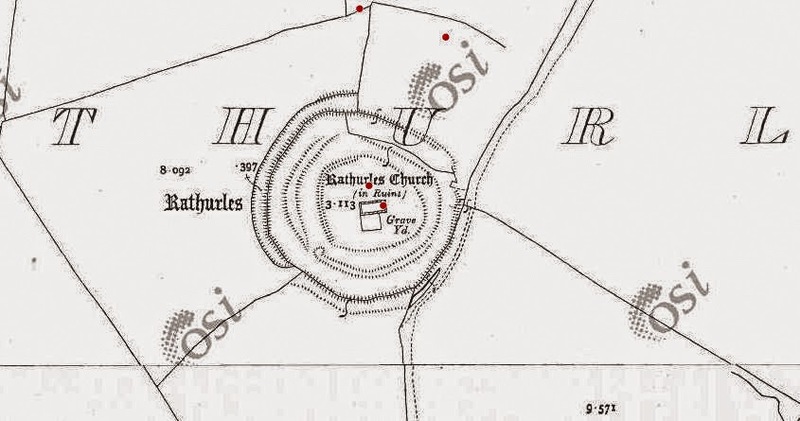 A few other snippets were found - one by former North Tipp heritage officer (Siobhan Geraghty) who produced a gazetteer of North Tipp Heritage and wrote a piece on Rathurles describing it as “Rathurles ‘ring fort’ probably a ritual inauguration or assembly site either iron age or pseudo Iron age (12th century?). Rathurles fort and church. (Fort only, described as ‘Prehistoric Trivallate Rath’).” This document was available on the County Council website but is no longer available. In the Royal Society of Antiquaries of Ireland 1906 there is a reference - “perhaps to Nenagh, originally Aenach Thete, but later Aenach Urmhumhan, the assembly place of Ormond” giving an older name for the Aenach. 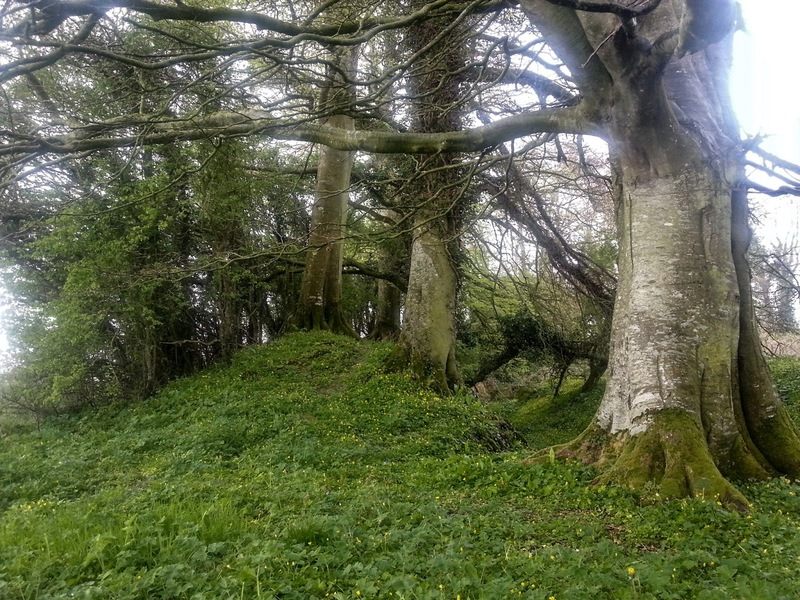 The author also found another link to Aenach Thete, this time in a paper by Patrick Gleeson titled “Kingdoms, Communities, and Óenaig: Irish Assembly Practices in their Northwest European Context” linking Aenach Thete or Téite with a mound approx. 5km away to the south west of Rathurles at Tullaheady. 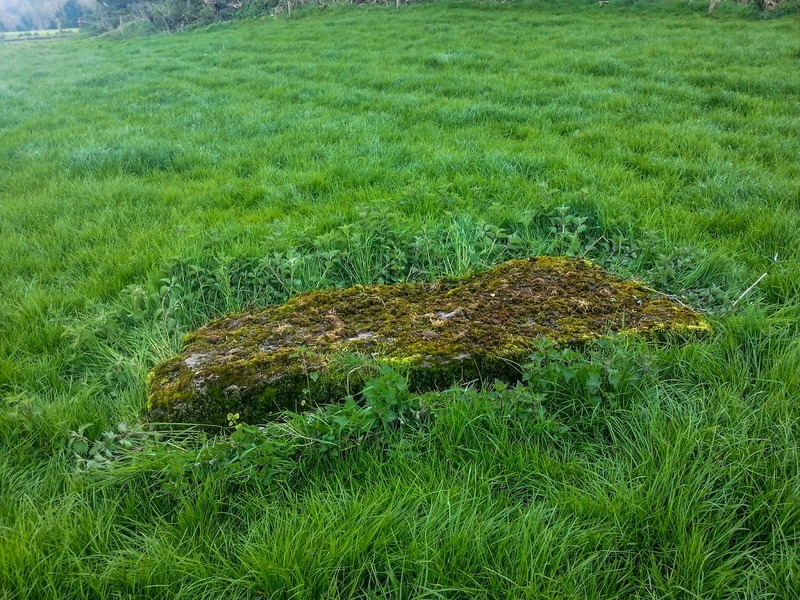 Tullaheady comes from the Irish Tullach Teite with Tullach meaning mound or hillock and Téite being a mythical female that was buried there. Gleeson also states that Aenach sites can have many different focus points within a broad landscape. 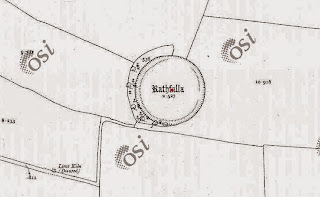 Firstly Rathurles is a trivallette ringfort – it is suggested that trivallette ringforts were the residences of higher status individuals during the Iron Age. 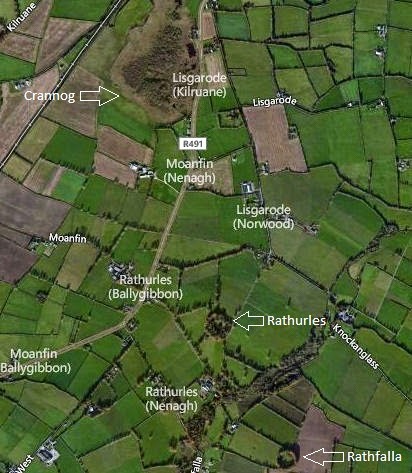 To the north-west in the townland of Rathurles Commons is a crannog of which again little research has been done on. Crannogs are often associated with higher status sites and as such its location within the vicinity strengthens the argument that this ring-fort is possibly an early Iron-Age royal site. In terms of size, the actual diameter of the fort from google maps is 160m rather than 55m (which is the internal diameter given in the Archaeological Inventory). 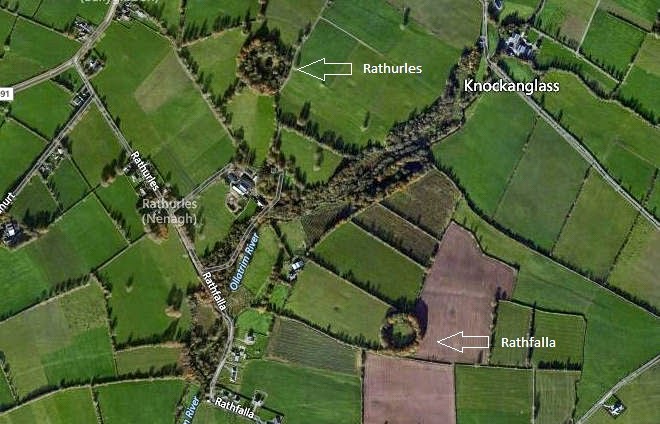 To give you an idea of the diameter of some other royal sites in Ireland - Knockaulin in Co. Kildare is 462m, Tara (although not circular) is 308m, Navan Fort is 268m and the one that is nearest in terms of distance, Rathnadrinna outside Cashel, is 140m in diameter. Rathnadrinna is also the closest in terms of size. The author considers that from the research in the various literature reviewed above that it can be argued that Rathurles is much older and more important than considered today. The other features at the site are also worth examining. Is the depression to the west of the site evidence of a collapsed souterrain? Or could this just be a hole that has been quarried out? 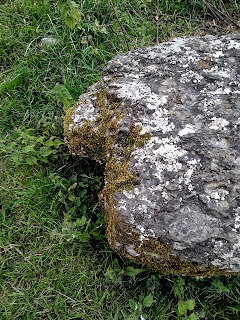 The “remarkable stones” are also an enigma – the author has not been able to find any back-up as to why they have been dated as 19th century in date. At a minimum it has been shown that other ring-forts had stone entrances and if so they must be dated much older than the 19th century. 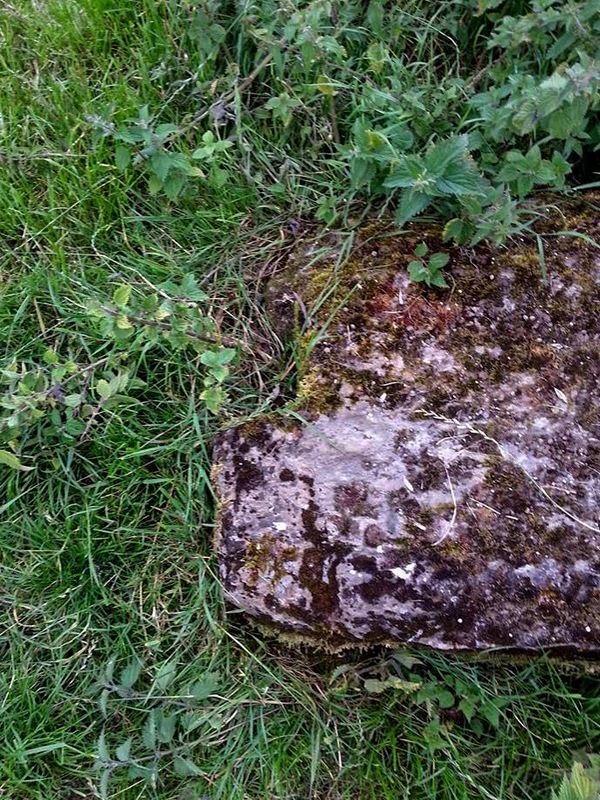 These stones do not seem to follow any old field patterns and so their current location is unusual. 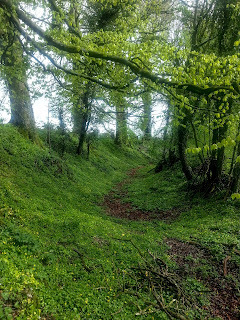 Why would they have been dragged from any possible entrance of the ring-fort to their current location of approximately 10m to the north of the fort. 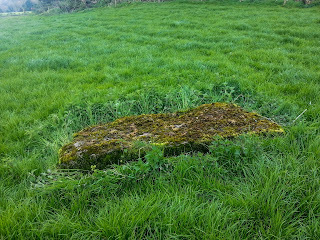 Could they be a pair of fallen standing stones? 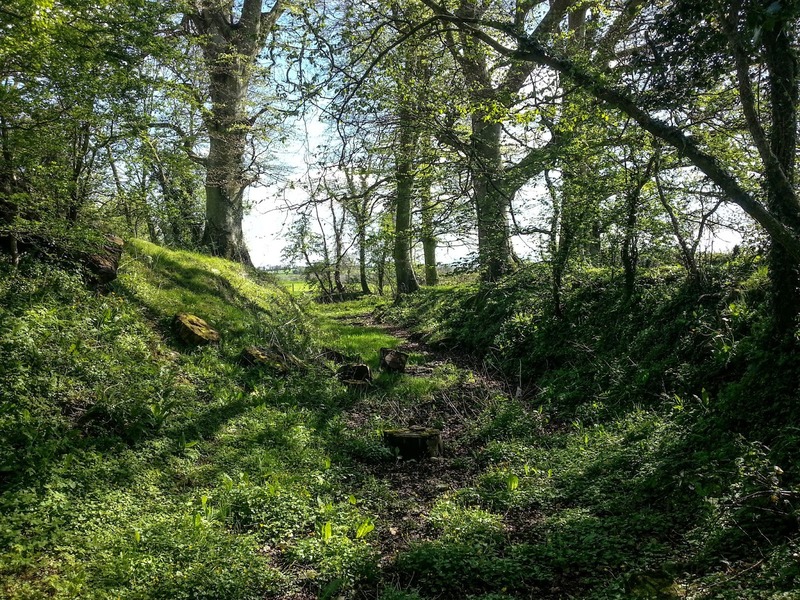 Recent excavations at Rathnadrinna ring-fort near Cashel have pointed towards evidence of a bronze-age date for the founding of that site. The morphologies of the two forts are similar with both being multi-vallette ring-forts of similar size. 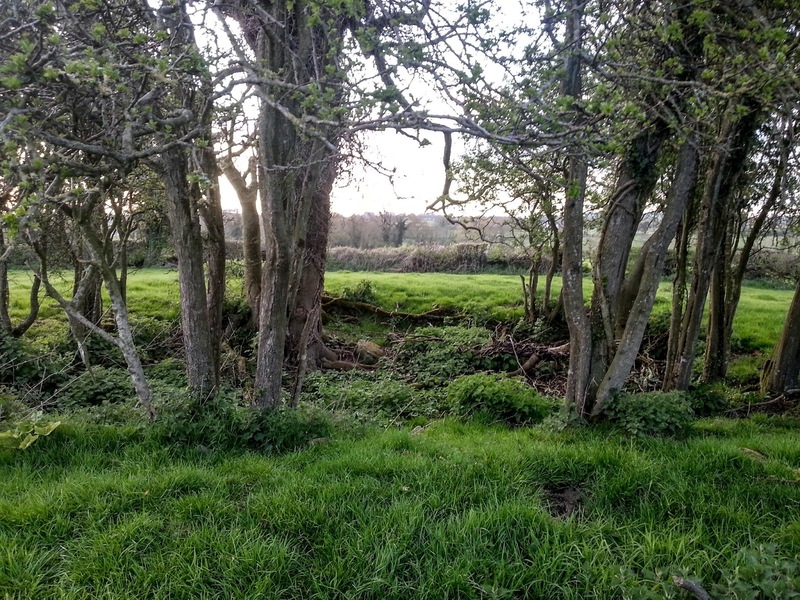 It is also suggested the site of Rathnadrinna was a “royal” site for the inauguration of the kings of Munster at various times (click here). 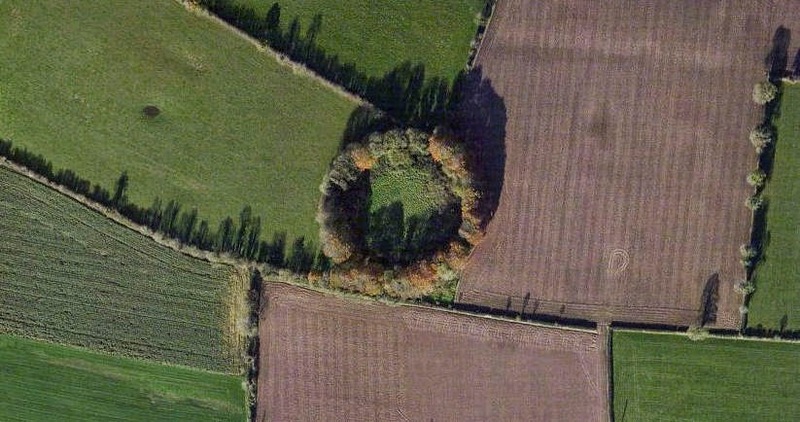 There are a number of references as outlined above that the ring-fort is prehistoric in age. All this evidence suggests that further research is needed to ascertain Rathurles's true age and significance. Ring-fort - Situated just below the crest of a rise on ground sloping to the SE. A large circular area (diam. 90m N-S; 88m E-W) defined by a scarp (H 1.96m), a wide U-shaped fosse (Wth 6m) and an outer bank (Wth 4m; int. H 2.73m; ext. H 1.35m). Causewayed entrances are located at SW (Wth 3.6m) and SE (Wth 3m) - the latter does not appear to be original as the outer bank is partially intact. 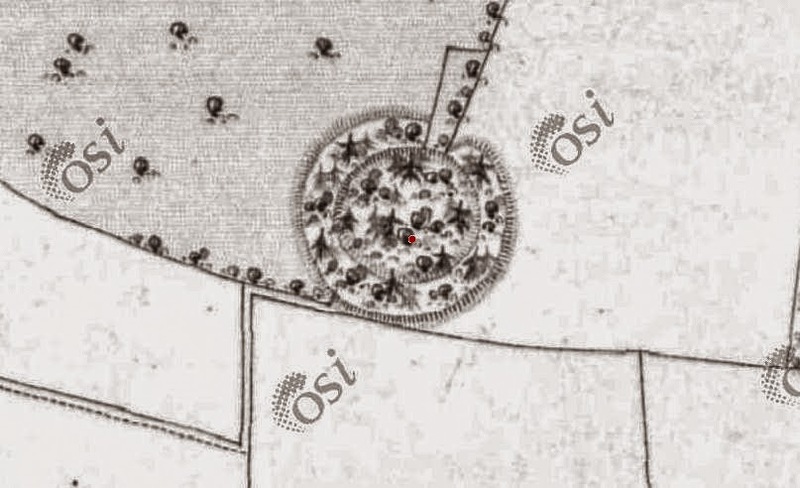 The outer bank has been planted with mature beeches and is much denuded at S and SW. A deep channel (Wth c. 2m; L c. 11m) cuts through the outer bank at SW.
What this description does not address is that ditch of the “ring-fort” is in fact internal. The rule of thumb for a monument is that if the ditch is external it is defensive and internal it is ceremonial. The distance from Rathurles to Rathfalla is just 0.875m. The Ollatrim river does separate the two monuments but the aforementioned “barnaderg” suggests that there was always a fording point or gap over this river in antiquity. 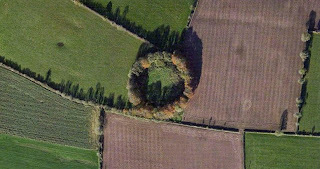 If Rathfalla is a previously unrecognised henge monument then its dating also needs to be reconsidered. The dating of henges in Ireland would point to a far older date. Henges can vary in date from the Neolithic (Giant’s Ring, Co. Down) and in the case of Lismullin Henge in Co. Meath to the Iron Age. 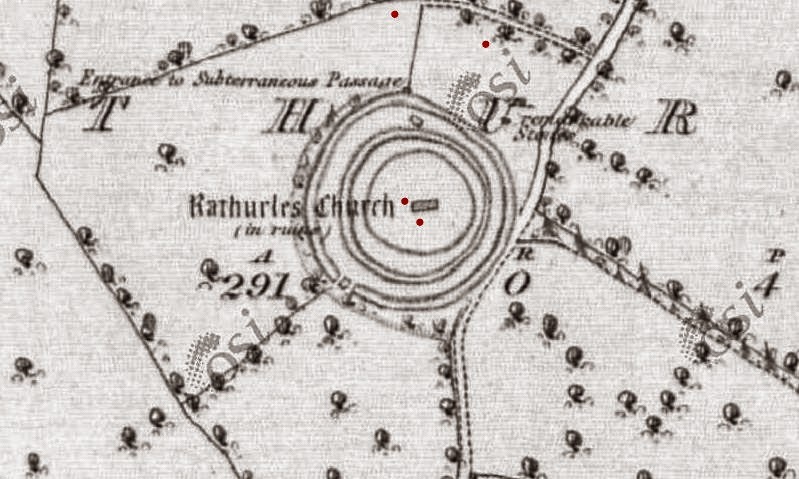 The proximity of a possible henge at Rathfalla (Ráth Bhaile or Rath of the town) would greatly strengthen the case for not only Rathurles being older than previously considered but that these monuments encompasses a “royal” site similar to that at Rathnadrinna in South Tipperary. 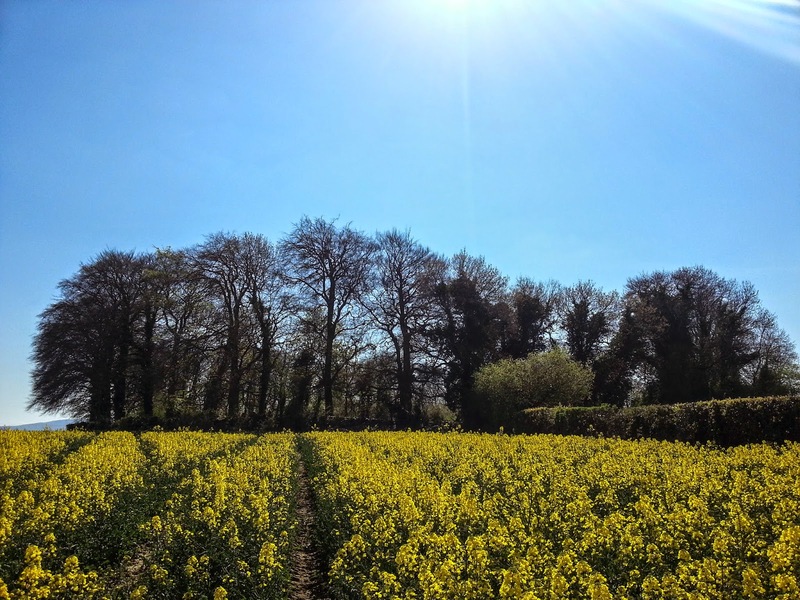 For a “walk-thrus” of a section of Rathurles to get an idea of its size, click here. 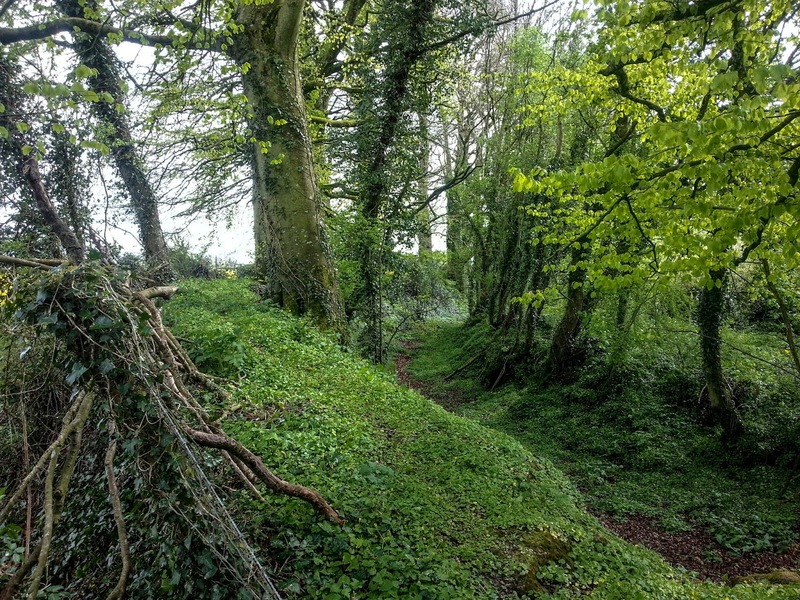 For a full “walk-thru” of the bank and ditch of Rathfalla, click here. For the archaeoastronomers out there – the entrances of both Rathurles & Rathfalla are in the direction of the setting-sun at Winter Solstice. Aerial photo from Bing giving the locations of the principle sites in the area. 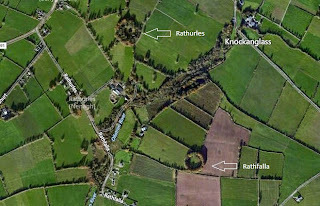 Aerial photo from Bing showing the relationship between Rathurles and Rathfalla. 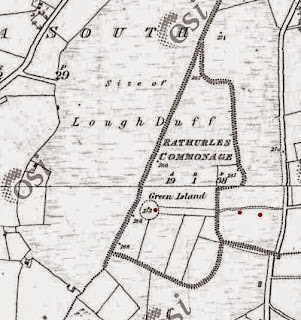 1840s OS map of crannog at Rathurles Commons. 1840s OS map of Rathurles. 1840s OS map of Rathfalla. Aerial photo from Bing showing Rathurles. View of Rathurles from the South. 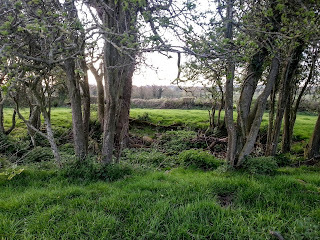 View of the ditch at the East side of Rathurles. View of 'Remarkable stone' 1 looking East. View of the tenon of Remarkable stone 1. View of Remarkable stone 1 from the North. View of Remarkable stone 2 looking East. View of Remarkable stone 2 from the North. View of the tenon of Remarkable stone 2. Unusual depression to the West of Rathurles. Overgrown church that is found at the centre of the rath at Rathurles. Aerial photo from Bing showing Rathfalla. View of Rathfalla from the North-East. View of Rathfalla from the West - note the unusual pooling. Break in the bank of the henge at the West of Rathfalla. 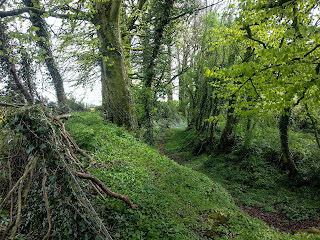 View of the bank and internal ditch at the North of Rathfalla. View from within the ditch at the North of Rathfalla. Derek Ryan Bawn is a regular contributor at The Modern Antiquarian and runs a fascinating blog dedicated to the recording of archaeoastronomy. To visit Derek's blog, click here. To view the accompanying Facebook page, click here. We are very grateful for his contribution.